arker's subsidiary in Newhaven in the UK had been around since the thirties and since then had produced a vast number of attractive designs, not found in the US. Especially in the Duofold lines. The 1980's was a tough decade for Parker. 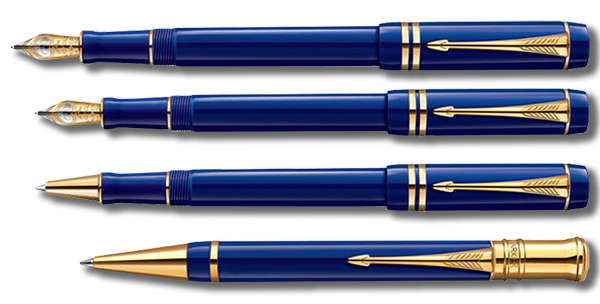 Fountain pens had quickly become unfashionable and Parker relied heavily on the proven designs, the Parker "75", the Parker "45", Parker "51", Parker "61" and the Classic. Something radical had to be done to save the writing instrument division. It was soon clear that the 1980's was to be the decade of the UK Parker subsidiary. 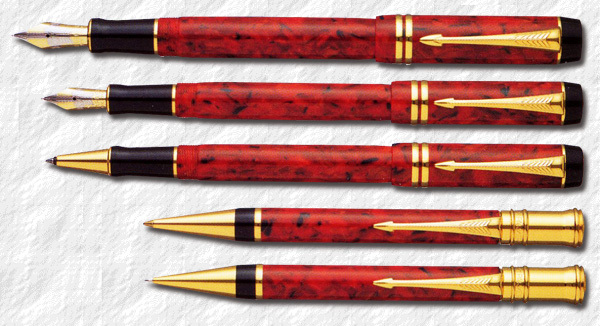 Several UK-designed new pens were launched over a few years. First out was the RB-1, for Roller Ball. It was launched in July of 1981 and the largest ad campaign in the UK company's history commenced. The RB-1 was soon followed by the similar US made Arrow in August 1981. The introduction in turn was described by Parker as the most massive marketing effort since the launching of the Parker "45" in 1960. ut although both the RB-1 and Arrow sold well. They weren't really the life-belts Parker had hoped for and times were getting increasingly harder for Parker. Parker's manufacturing facilities in Janesville were old and inefficient and by 1982 Parker's net income was down with 60%. In December 1982 the Parker factory in Toronto closed down production and assembly line. Only distribution and repair remained. George Parker II decided to bring in a new management team from outside the company, and in an effort to cut costs 25% of the worldwide work force was made redundant. 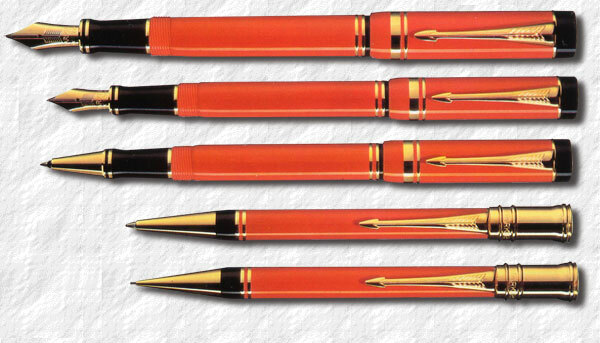 Also several pen models saw price reductions in 1983 in an effort to boost sales. $15 million were invested in a new hyper-modern factory in Janesville and In the autumn of 1984 another member of the Arrow/RB-1 family was introduced, the Vector. The new management decided on a global marketing strategy, which unfortunately failed horribly and Parker Janesville would never again recover from the financial blow. Instead it was Parker's subsidiary in Newhaven who continued to flourish. 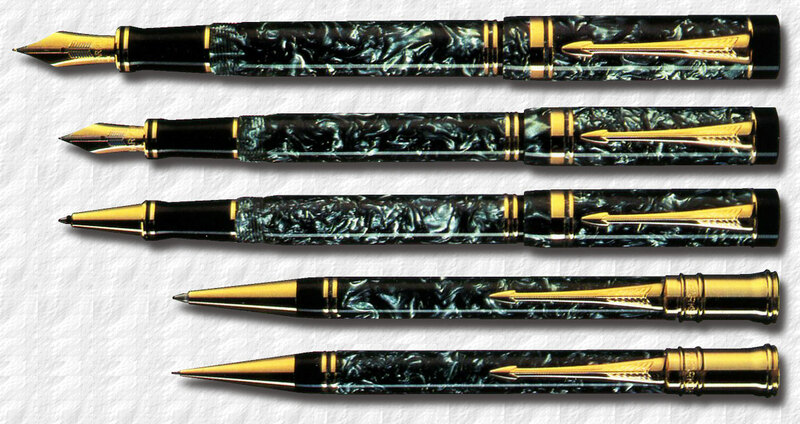 ventually Parker Newhaven succeeded in a buyout of the Writing Instruments Division, and in 1986 the corporate headquarters moved to Newhaven, England. The Vector became one of Parker's most selling models and is still around today. 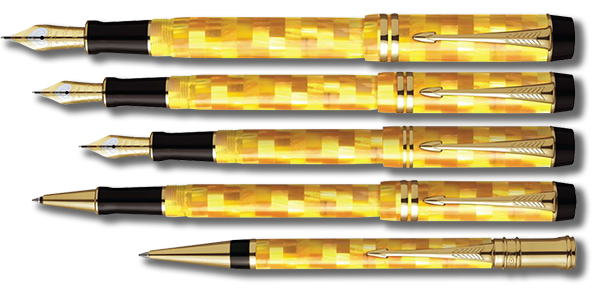 Other successful designs like the The Parker 25, the Sonnet, Frontier, Insignia, Parker "100" and the Centennial Duofold all came from Newhaven. 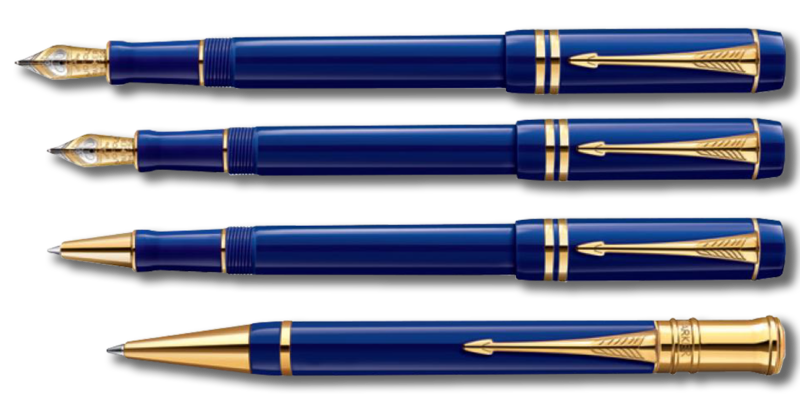 Immediately after the UK takeover Parker's new chief executive officer, Jaques Margry, launched plans to commemorate Parkers 100-year jubileee with a new pen. 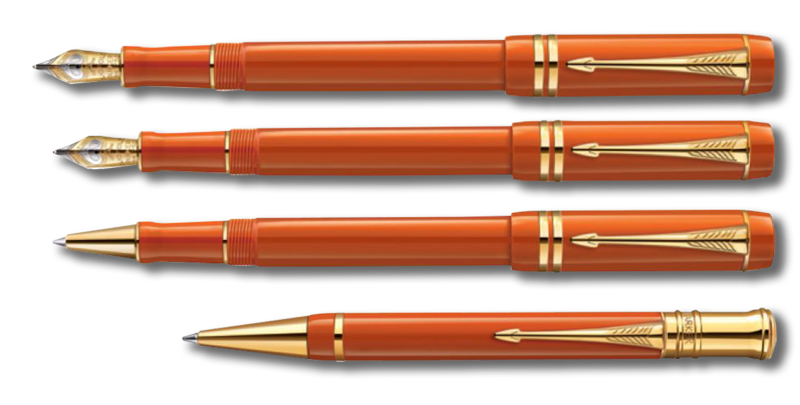 It was both logical and, as it turned out, a successful strategy to base the new pen on the design that originally built the Parker pen company and brand name, the 1920's Duofold. Of course Newhaven had previously had great success in producing Duofolds. 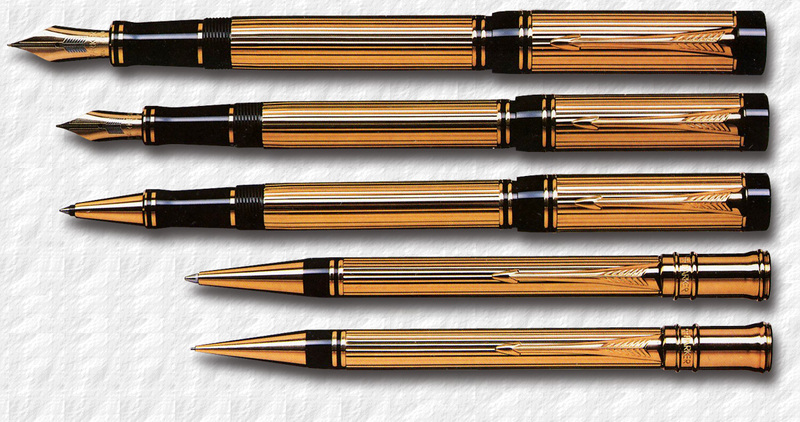 The first ones manufactured already during the early 1930's, and later in the 1940's with the Duofold NS, followed by the AF Duofold, in turn followed by a wide range of aerometric Duofolds, referred to as the New Duofold. But the new 1980's Duofold would be more closely based in design on the Big Red, that had built the company before. Margry called it the Centennial. It was to be the most modern fountain pen to date. With a ten day computer controlled manufacturing process, and made from over 130 components it was subjected to 100 quality tests. The large nibs alone, punched out from a single gold sheet, had 21 production stages. 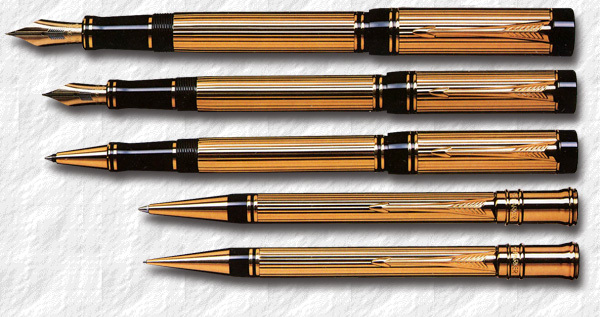 Parker boasted that the nib was the largest solid gold nib in the industry. They were hand-slit with a blade fine as a human hair and finished by tumbling for 48 hours in a barrel filled with walnut shells, and then hand polished. In 1990 a new clip in higher relief that was manufactured to hold to be bent 100� 000 times without losing its spring By the summer of 1990 new additions were made to the Duofold line, a 9 mm Mechanical Pencil, a Roller Ball and a new twist action Ball Pen replaced the old cap actuated model. It utilized a unique oil-cushioned twist mechanism meant to make the retraction of the refill silent and smooth. The roller ball would write 2 km and Parker used Swiss watchmaker tools to achieve a ball housing with a tolerance of 0.001 millimetres. 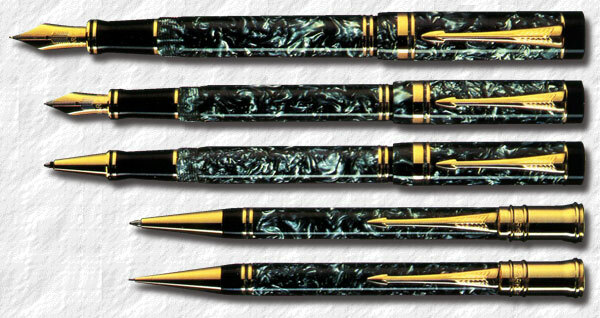 he Espartos were offered in the International size only and also as a Ball Pen. 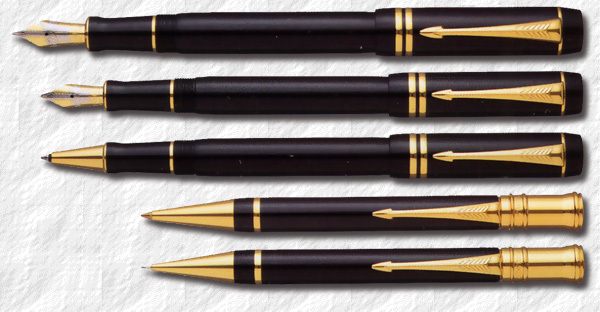 The new Ace line did not offer any mechanical pencils, the only finish with a pencil now being the Black GT. In 2007 the Black and Pearl was re-introduced with the Ace spade emblem, again without a matching pencil. In 2008 a completely new size of Duofolds was introduced, the Demi. It was offered in every design, except the Presidential Espartos and in May a new attractive Check colour, the Check Citrine, was introduced. 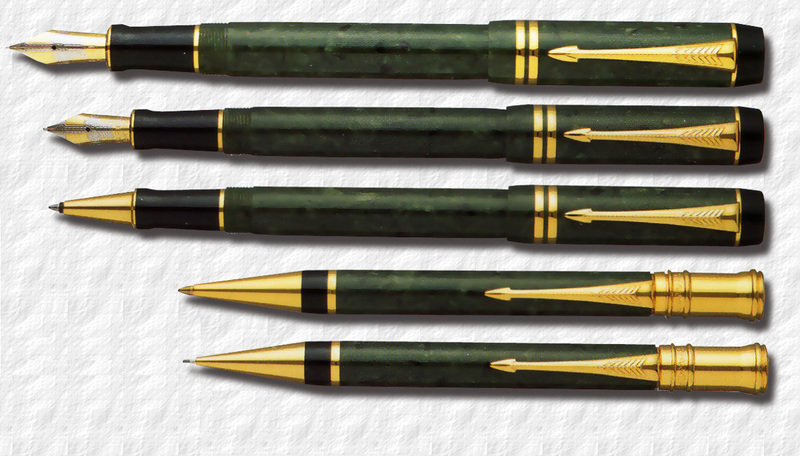 Already in 2009 the Check Olive was discontinued, again proving that green pens weren't selling very well. In 2010 the Presidential Esparto Gold was discontinued. Also, in the autumn of 2010, the factory in Newhaven, Uk was closed down and the Duofold production was moved to Nantes, France. 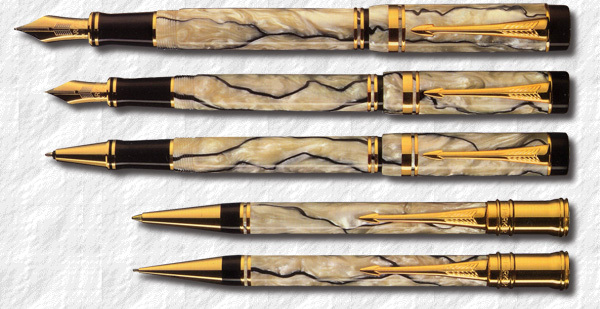 The last pen made in Newhaven was a Limited Edition referred to as the Newhaven staff, a Duofold International in Pearl and Black which was presented to the factory workers. The certificate of authenticity stated that it was to acknowledge the dedication of the Newhaven staff. The crown featured the new halo logo and read "Parker Newhaven 1941-2010". It was offered in a black bag with an outer cardboard box inside containing a laquer wooden box with the pen. The rumour is that a production of 180 items were planned to be made, but already after the first wave of 20, items began popping up for sale on auction sites, so Parker allegedly stopped the production and recalled 14 of the 20. Duofold MK III Check Marine. Duofold MK III Check Citrine. 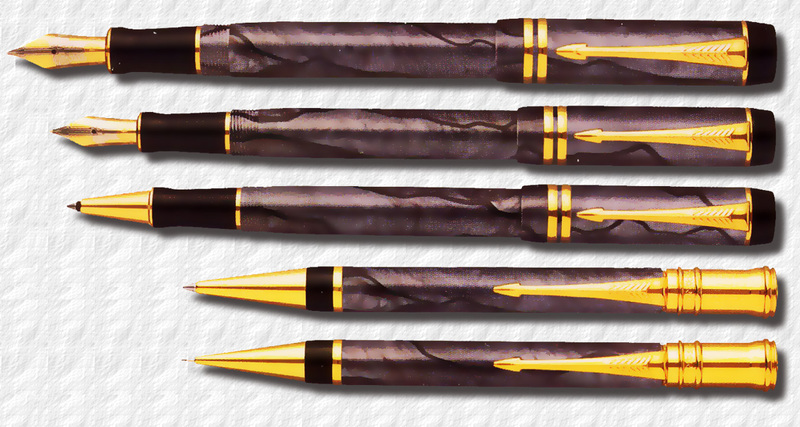 In 2012 the last of the Duofold pencils, the Black GT was discontinued. I n 2013 Parker celebrated its 125th anniversary (George S. Parker founded the company in 1888). A worldwide celebration tour kicked off on January 25 at the Sinan Mansion in Shanghai, China with an exhibition about writing, under the slogan "Words for the Future". Geoffrey Parker, the great-grandson of the company founder, was a special guest. 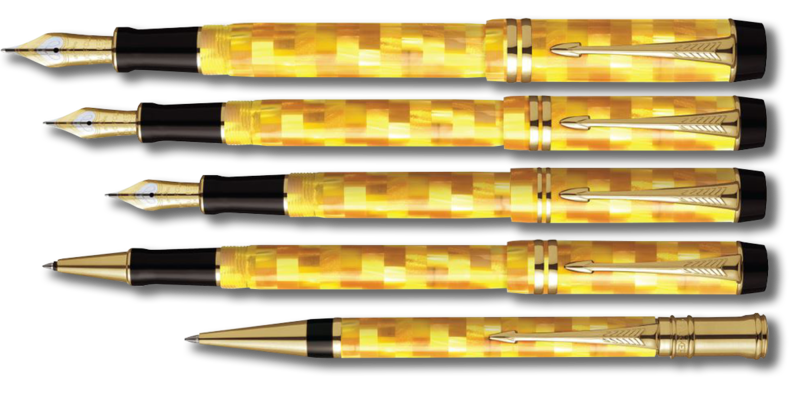 To commemorate this a Mandarin yellow limited edition Parker Duofold was offered, as well as 125-anniversary Jotter and Ingenuity pens. Also a Duofold Giant limited edition was offered, with only 125 pieces available worldwide, as well as a Duofold Senior limited edition. These limited editions are covered in the Limited Edition-chapter. 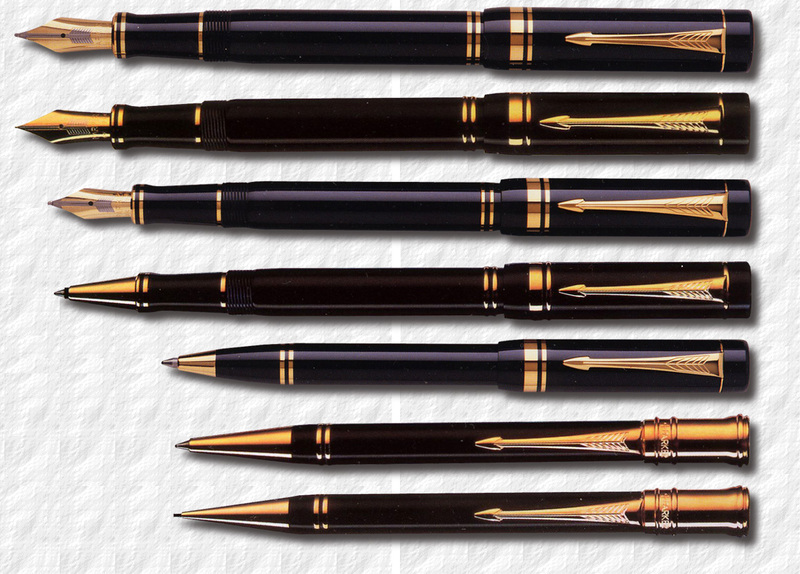 The 2013 Parker catalogue offered no change in the Duofold line-up. I n 2014 the Demi Duofold was discontinued after a short six year stint. 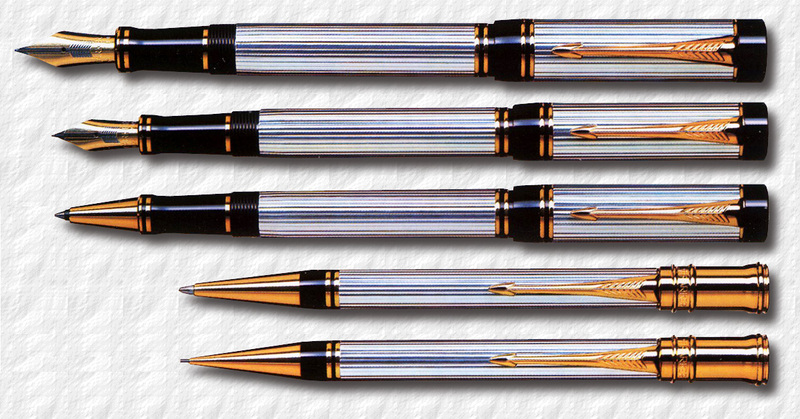 Parker was in the process of redesigning the Duofold line. To allow stores to sell out old stock only the three bestselling designs were featured in the 2014 Parker catalogue, the Pearl and Black and the Black GT. The third finish looked the same as the previous Black Platinum, but instead had trim plated in palladium. The latter not offered in the Centennial size. Palladium belongs to the platinum group and doesn't react with oxygen at medium temperatures, which means that it wouldn't tarnish easily. Another reason for the change was that palladium in 2013 fetched less than half the price of platinum. The new 2015 line of Duofolds was inspired by the Parkers of the 1920's. 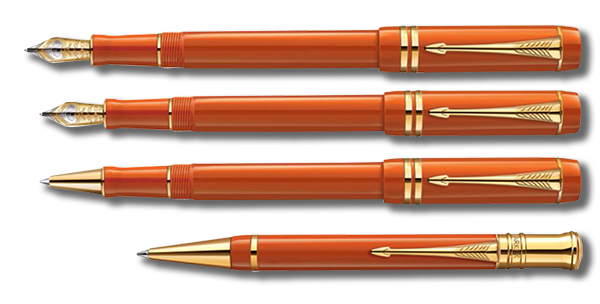 They still sported the Ace nib and crown and two cap rings but three new colours were offered, the Big Red GT, maybe the most recognizable design of all Parkers, in red cast acrylic and 23K gold plated trim, a new Lapis Lazuli GT in blue. Although based on the old Duofolds the colours weren't exactly matched, in particular the original Lapis Lazuli were marbled in blue on blue or white on blue. The third new addition was the White Ivorine GT. It was based on a now rare Parker casein pen, a sort of plastic made from milk curd. 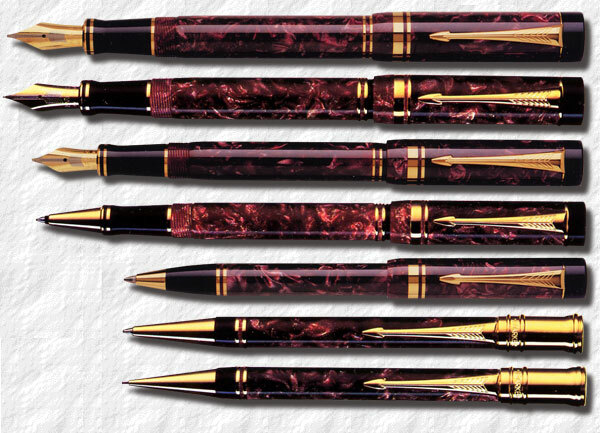 Together with the Black GT they were offered as Centennials and Internationals, with fine or medium nibs, and as a ballpoint and rollerball. The Black Palladium International was also offered. All finishes had clip screws and sections in the colour of the pen body. Duofold MK III Big Red. 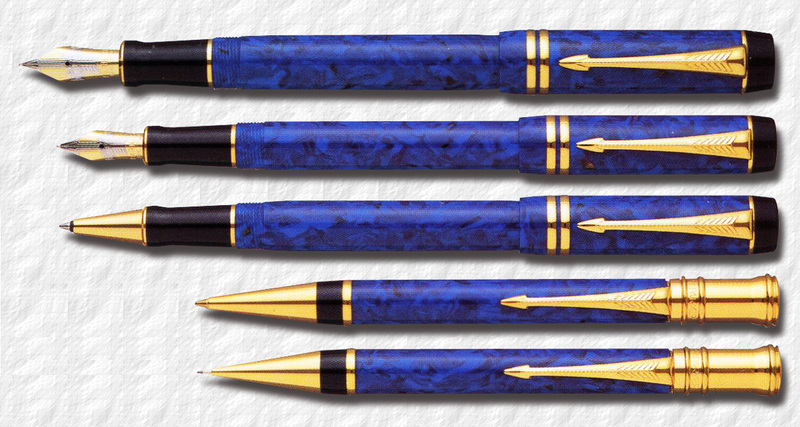 Duofold MK III Lapis Lazuli. I n 2016 the Duofold was redesigned again and. two new Duofold lines were introduced, the Prestige and the Classic collection. A new style cap band, about 8 mm wide and covering the cap lip was also introduced. It was sort of a mix between the caps of the Parker "51" and the 1937 Vacumatic. It was in the form of three cap bands toghether, with "Parker" engraved on the middle one. The new flagship was the Ruthenium Chiselled CT, which in fact had palladium trim. It was a ruthenium plated base with a chiseled, banded design. 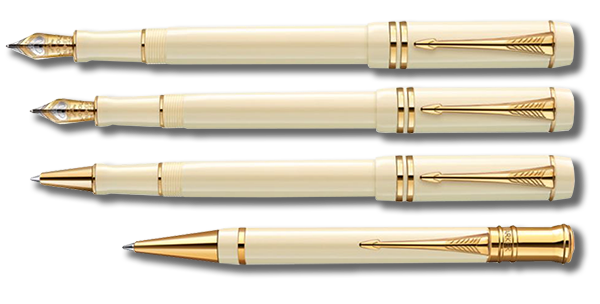 It was only offered in the larger Centennial size and as a ballpoint and rollerball. 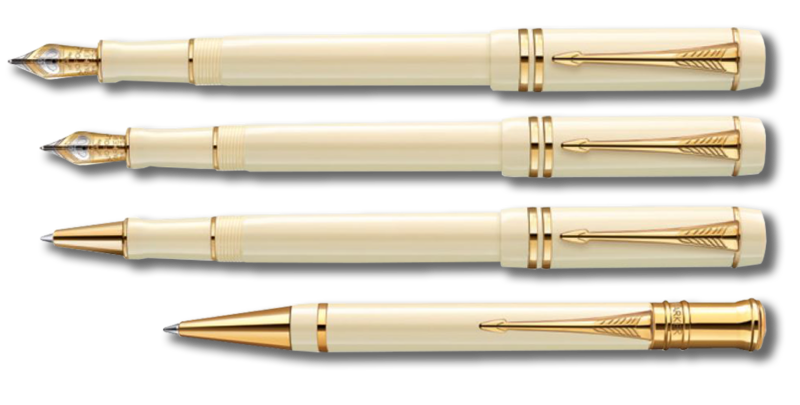 It was offered at $1.000, with the rollerball for $800, and the Ballpoint for $650. The Blue Chevron GT was another very attractive finish offered. It sported a metallic blue varnish with etched chevrons, and 23K gold plated trim, including the clip screw and section. 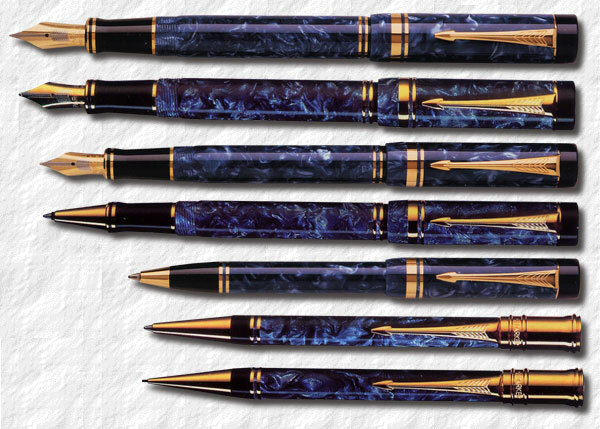 Also offered as a Centennial, rollerball or ballpoint. It cost $970, $775 and $630, respectively. 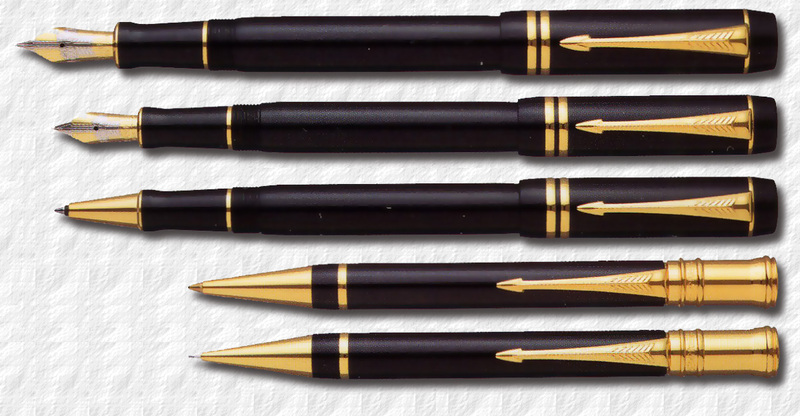 The Black Chevron CT was a laser etched, chevron patterned pen with a black lacquered base, and palladium trim. 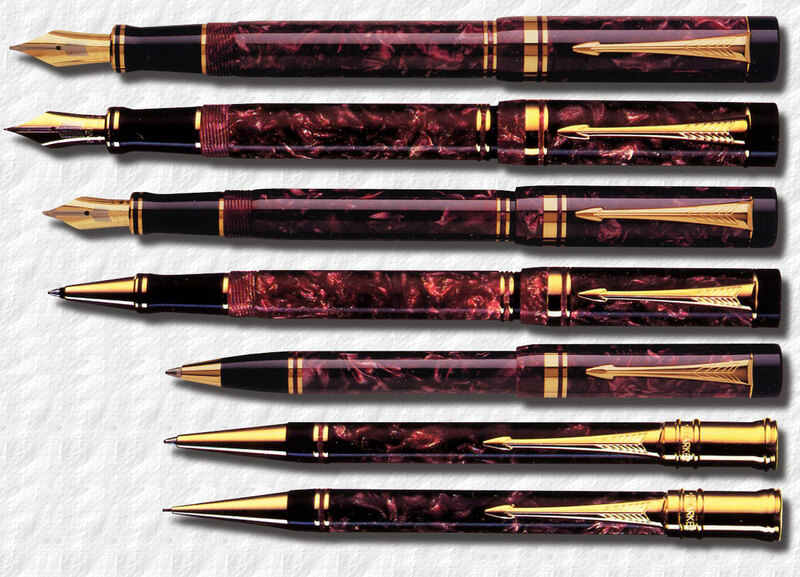 The third Prestige was the Burgundy Chevron CT, identical to the Black Chevron, but with a burgundy laquer base. The three 2015 colours were now offered with the new style cap band and with a black clip screw and section as the Duofold Classic Resin Collection. 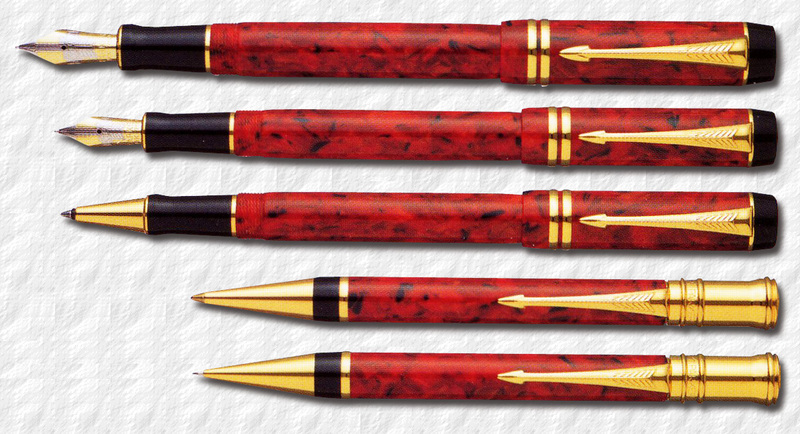 The Big Red CT Centennial cost $730, the International $665, the rollerball $530 and the ballpoint $430. 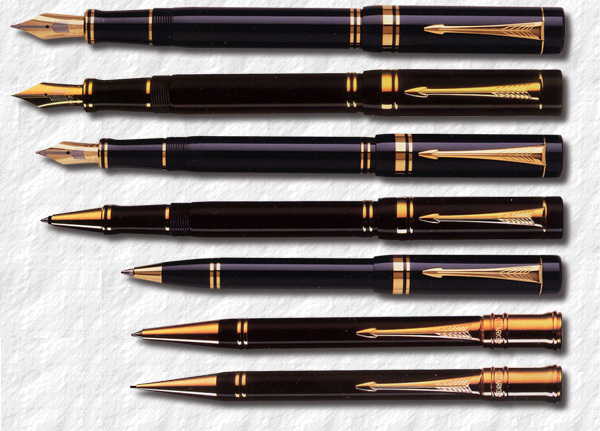 The blue version was renamed the Blue & Black CT, and the Ivorine was renamed the Ivory & Black GT The two black finishes also sported the new cap band, but the Black Palladium was renamed Black CT.
To date the Centennial Duofold has been around for three decades, and it is still Parker's top of the line pen. Still going strong and still used as a base both for Parker Limited Editions and also by other pen makers for different finishes. I doubt that we have seen the last Duofold designs.